More city budget cuts are up for discussion, but the end of the chopping block is far from near. In an attempt to close a projected $2 billion budget gap, Mayor Michael Bloomberg proposed another round of cuts last month, cutting hundreds of jobs by attrition and lay-offs. Among the hardest hit will be the Departments of Sanitation, Cultural Affairs and Health and Mental Hygiene. Layoffs, Doulis said, have been "a last resort" over the years, particularly in departments that provide core services, but the city has exhausted typical saving strategies like renegotiating contracts, "so now we're going towards real service cuts," she said. And what’s more, Doulis predicts that before a 2013 budget is adopted this summer, the Mayor will announce another round of budget cuts. Last year’s midyear budget cuts focused on cutting capital spending, with Mayor Bloomberg asking for a 20 percent cut in spending for construction and maintenance of city-owned buildings and infrastructure, but now, Doulis says the city is running out of ways to find savings and income. The statement also announced a Wednesday summit aims to finalize some sort of deal, but no solution has been announced as of press time. If the bill isn’t resolved in Albany, the city’s expected deficit would increase by a third — bringing it up to $3 billion dollars. The Governor’s announcement of the planned summit indicated that the unresolved issue was less about the city and the governor’s office, and more about the yellow-taxi industry’s worries that giving livery cabs medallions, which have been picking up street hails illegally for years, would devalue their pricey medallions. “The issues are not primarily governmental ones among the Governor, the state legislature and the City. There are, however, remaining issues among the various stakeholders, business and advocacy groups whose interests must be reconciled," yesterday’s statement read. As reported by Capital New York, the Bloomberg administration was not invited to the summit until well after its announcement. Recchia said that the Council would negotiate with the Mayor and some version of the proposed cuts would be approved by the City Council, though it is unclear whether or not the Council would have a hearing on the matter, which Councilwoman Letitia James has called for repeatedly. “The best way to disclose all of these cuts and more is for the Council to hold an oversight hearing,” she said. In a discussion on a Council bill that would add more oversight on the city’s contract spending during last week’s stated meeting, Councilman Charles Barron criticized the city’s contract spending and his colleagues for not addressing the issue during budget discussions. "We should not sign off on a budget that has the kind of contracts you’re speaking so eloquently against today," he said, as his colleagues criticized high-prices for outside contractors doing work that critics say city employees could do. Since the Mayor took office, the city contract budget has grown by 70 percent. Despite the huge gaps, Recchia added that “we have to stop nickel and diming the people of New York City,” referring to the fine and permit hikes the city has begun using to try and draw in revenue. The city also found income sources by raising restaurant fine enforcement, fingerprinting fees, and refinancing some debt. But those fine hikes and other small changes represent a small portion of the city’s cost cutting measures, Doulis said. The refinanced debt will save the city $229 million in the coming year. Future cuts, Doulis said, will likely start eliminating core services more than ever before. The Mayor’s cuts to the Sanitation Department have come under criticism, particularly in light of last year’s snow-removal disaster, but the Independent Budget Office’s Doug Turketsky notes that the majority of these cuts are cuts of attrition, as the Marine Transfer Stations the department would have staffed won’t be completed by 2013. He also added that there is a significant snow budget that covers winter weather costs. The City Council voted unanimously yesterday to override a mayoral veto in a rare rebuke to Bloomberg. The City Council voted unanimously yesterday to override a mayoral veto of the Outsourcing Accountability Act today — taking a stand against outsourcing and the mayor, too. The bill, dubbed a “no-brainer” by Councilmembers, aims to save the city money and keep contracts with city workers. It was passed unanimously in October by the Council , but the Mayor vetoed it last month saying that it keeps the city from getting the best deal for their money. The bill 624-A will require the City to perform cost benefit analyses for some outsourcing contracts, give public notice of planned service contracts to allow for more competition and bidding, and if possible at a cheaper rate, award the contracts to city employees. The vote continues the Council’s departure from their ordinarily cooperative relationship with the Mayor, which was kicked off last week when Quinn announced that the Council would sue the Bloomberg administration over a policy requiring people to prove their homeless status before receiving shelter. Quinn, who is leading this move, is a likely mayoral candidate in the upcoming election; Bloomberg has seen as approval ratings slip as his third term drags to a close. The city has come under fire this fall for a lack of oversight in city contracts, leading to fraud and hiked prices. The Department of Education was overcharged by at least 6.5 million by an outside firm, the city’s special commissioner of investigation recently found. And who can forget the notorious CityTime, a payroll system which was supposed to prevent fraud, but ended up costing the city $760 million dollars and leading to a federal criminal investigation? The Bloomberg administration has argued that private contractors can deliver services more cheaply than city workers, though Quinn is quick to note that the bill increases oversight, it doesn’t stop the city from hiring private companies if indeed the service comes cheaper. Bloomberg has also questioned such a bill’s constitutionality, which may bring the whole matter to court, though a mayoral spokesman wouldn’t comment on that yesterday. The vote was among the first legislation passed in the recently renovated Council Chamber, which has been upgraded and preserved as part of a larger $119 million dollar City Hall renovation. “The roofs are no longer falling in,” Council Speaker Christine Quinn said with a laugh inside the Council Committee chamber, where she recalled plaster had fallen from the ceiling during Committee meetings earlier this spring. The Council used a temporary gathering space in the Emigrant Savings Bank Building for the past five months. The Council Chamber itself, amongst other upgrades, has refinished and polished wood paneling and new curtains (which lack the binder clips Quinn said had held them before — “Nothing says dignified government like a binder clip,” she said with a laugh.) The building is also being brought up to code, extending an elevator to the third floor to make it handicap accessible, and installing a sprinkler system. It is the first significant construction of City Hall in more than a half-century; renovations are expected to be complete by 2012, in time for the building’s 200th anniversary. “Speaking of Greenâ€¦” Quinn quipped, referring to the new green paint in Council offices below the Chamber, the city will be getting â€greener’ thanks to several pieces of legislation passed in today’s stated meeting — notably, the Council approved the first Energy Neutral school. The school, which will be built on Staten Island in the Rossville/Woodrow section, will have 444 seats and will open in 2015. Three other code additions will also keep the city from polluting its water, land, and air: the first prohibits water used to rinse concrete off equipment at construction sights from being disposed in the sewer system; the second will increase the use of recycled asphalt, and the third requires additional filters in heating and air conditioning systems in new buildings. Transit Worker Union members get their message out in past years. The contract negotiations between the Metropolitan Transportation Authority and Transport Workers Union Local 100 TWU, which began last monthseem poised to widen the rift in the already strained relationship between the agency and the union representing some 34,000 bus and subway workers. Certainly the talks â€“ along with the agency's budget crunch â€“ represent two huge and interrelated challenges for newly named MTA executive director Joseph Lhota. Lhota's efforts to cope with the agency's budget crunch rely to a great extent on how much he can or cannot get from the union. The authority wants workers, whose contract expires Jan. 15, to agree to a three-year pay cut and reportedly also is seeking to cut employees health care costs. For now—at least publicly â€“ the union has rejected both ideas. Much has changed since the union struck, shutting down the transit system for three days right before Christmas in 2005. The agency's financial system has gotten worse and two new people will face each other across the negotiating table. As they began their negotiations in November, the union and the transportation authority confronted two familiar issues: health care benefits and wages. Health care will be a key issue during contract negotiations, according to Jim Gannon, head of communications for the TWU. The union plans to oppose any proposed increase in out-of-pocket healthcare payments and or the termination of members' healthcare plans. The fight over healthcare is not new. In September, the TWU filed a grievance with an arbitrator over the MTA cutting healthcare for members, a move the union says violated its previous contract. The TWU alleged that the MTA has saved $40 million by finding new healthcare providers that require workers to pay more for the plan, while reducing coverage. "There are issues with prescriptions, issues with hospital stays. There is an across the board effort by the MTA to nickel and dime transit workers to death," said Samuelsen. The issues with healthcare come as the two sides ended a bitter battle over wage hikes. During the last contract negotiations, the transit authority refused to pay wage increases as a way to save $300 million in operating costs. The issue went to an arbitration panel, which awarded the workers a hike of about 11.5 percent over the three years of the contract. The MTA at the time didn't include any wage increases in its budget It then went to court to try to block the increase, but the judge found for the workers and the pay raise went through. This time around the MTA has said it will agree to pay hikes only if the union makes concession to offset the additional cost. "They can have an increase in their wages as long as we get work rule changes or other contributions to reduce the cost in the budget to zero," Robert Foran, the authority's chief financial officer, told Crain's. Samuelsen, though has dismissed the idea of the proposed three-year wage freeze -- even though other public employee union have agreed to forego wage hikes. "NYC Transit workers are not agreeing to the wage freezes that other unions have. Neither transit workers, nor any other public sector workers caused the economic downturn," Samuelsen said in an online letters to workers. "NY state needs to look toward the investment bankers and Wall Street swindlers who caused this crisis to balance the budget, rather than to the hard working families of the Transport Workers Union." 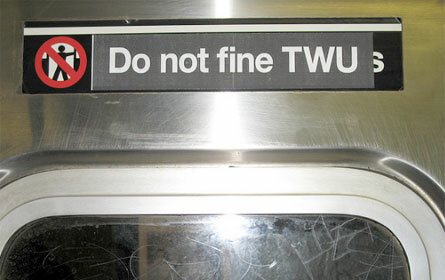 The TWU also criticized the MTA for once again not calculating pay raises in its 2012 preliminary budget. The financial plan released by the agency in July calls for a wage freeze and for fare and toll hikes in 2015. Lhota's appointment marks the end of a bitter relationship between the union and his predecessor, Jay Walder. According to Gannon, Walder's decision to try to dictate day-to-day operations strained the relationship between rank and file workers and leadership. "The relationship with the MTA was terrible when Walder was there. His attitude was my way or no way. He had an agenda that we viewed as an anti-worker, anti-union agenda and an anti passenger agenda," said Gannon. "His whole thing was technology and the capital program. ... He didn't believe that the system needed people and he went after the station agents and the cleaners." Throughout his tenure, Walder and the TWU fought over healthcare contributions and pay raises as well as the layoffs of rank-and [file transit workers. According to Gannon, 927 TWU members were laid off during Walder's tenure, the majority of them were cleaners or station agents. When Walder announced his resignation after two years, Samuelsen released a letter criticizing his leadership. "Transit workers won't miss Jay Walder and quite frankly will be glad to see him go," it said. Almost as soon as Gov, Andrew Cuomo named Lhota to the post, John Samuelsen, president of TWU Local 100 sent a message out to Lhota, imploring him not to worsen the bitter labor relationship between the MTA and the union. In the message, Samuelsen harked back to 1999 contract negotiations where the Giuliani administration got a court order preventing union members from suggesting labor actions and saying the word "strike." Lhota served as a deputy mayor in the Giuliani administration. "If Lhota wants to continue the policies of where Giuliani left off in 1999, then he's likely to have a problem with organized labor. If Lhota is looking to have a working relationship knowing that we are going to disagree on many issues, then that would be our choice, our preference,” said John Samuelsen of TWU Local 100. Samuelsen, though, also has expressed optimism that labor-management relations will be better under Lhota than they were under Walder. 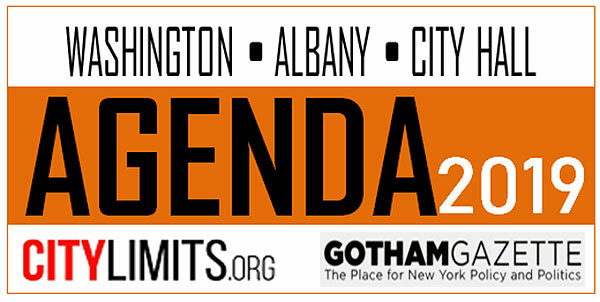 Even before he took office in mid November, Lhota and Samuelsen met several times, according to Transportation Nation. And on his first day at the MTA, Lhota signed a letter with Samuelsen urging prosecutors to crack down on passengers who attack transit workers. The letters reportedly was Lhota's idea. 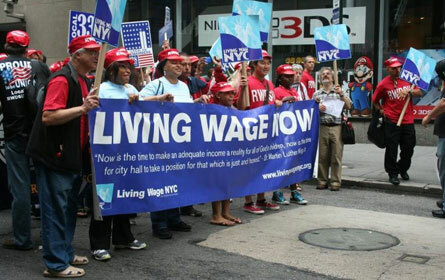 “For the workers to see that Lhota actually seems to care about them, that will go a long way,” Gannon told a reporter. Lhota bolstered that impression when contract talks began Nov. 15 and he told the assembled union members that authority's employees were its "most valuable resource." The workers reportedly roared in response. And at the end of the initial meeting, Samuelsen asked his members "to show respect for the bosses who are walking out of here right now." As for the union, Gannon pointed out that Samuelsen's relationship with union members is different than that of former TWU Local 100 President Roger Toussaint. While praising Toussaint's leadership, Gannon says that Samuelsen is more in touch with the daily needs of the workers. "John is far more of a blue-collar grass roots guy than Roger was. His contact with members is on a daily basis, he has tremendous one-on-one relationships with the members. He's more keenly interested in what the members needs are on a daily basis, their working conditions,” said Gannon. Along with the contract talks, Gannon said, the TWU is focused on its online petition to urge the MTA to develop a rat eradication program, its early support for the Occupy Wall Street protests, and its advocacy for the continuation of the state's millionaires tax. “The whole outreach through free media, the outreach through communities and supportive activities through other events and to show people that the transit workers are not the enemies. Were not money hungry greedy union thugs,” said Gannon. Residents of Councilmember Jumaane Williams' district in Flatbush met in October to review ideas about how he should spend his discretionary funding. From the Occupy protestors to millions expressing disgust with debt ceiling debacle, many American are angry about how the government spends money,. something most of them have little control over outside the polling booth. Now, four New York City Council members are trying to change this and give residents a direct say in where the funding goes, at least on a local level. "I walk down my street every day, wishing I could do something about the conditions," said Ali Abdul Rahman, a resident of Brooklyn’s 39th district, who is getting the opportunity to do some budget . "Well, now there is." Under the plan, resident volunteers take ideas from residents of their community and work with their council member to come up with a budget plan for capital projects. This will affect only the pot of money -- often castigated as pork -- that members get to allocate to their communities as they see fit. It will not apply to expense items, just money for new building or equipment or improvements to facilities. And so far only four of 51 council member are participating: Brad Lander of District 39, Jumaane Williams of District 45 in Brooklyn, Eric Ulrich of District 32 and Melissa Mark-Viverito of District 8. Most districts will allocate about a million dollars to the project though the exact amount of available discretionary will be determined by the council speaker, in the spring. Districts can usually count on several million each, some of which is already allocated to ongoing projects. The participatory plan faces the challenge of involving the community and educating people about how budgeting works. However, proponents of the program say that participatory budgeting enhances democracy on a local level, improves the relationship between elected officials and their constituents, educates the public about local government processes and can boost the popularity of elected officials. Participatory budgeting originally started in the Brazilian town of Porto Allegre 20 years ago. It then spread through much of Latin America, Europe and elsewhere, according to Josh Lerner of the Participatory Budgeting Project, a nonprofit organization, which tries to advance the practice in new areas. He said that the program exists in over 1,000 cities worldwide, in one form or another. New York is only the second place in the United States to try participatory budgeting after Chicago's 49th Ward represented by Alderman Joe Moore. The program was very popular there, according to Betsy Vandercook, Moore's chief of staff. It already is gaining ground among New Yorkers. "This is definitely the most popular thing we've done," said Alex Moore, Lander’s chief of staff. The process involves many steps -- and many meetings. first, the elected officials reach out to their constituents and invite them to large town hall meetings that anybody from the district can attend. There, residents get together into groups and brainstorm ideas on how to improve the district and take care of the most glaring flaws. Suggestions range from practical ones like fixing sidewalks and improving trash collection to outlandish ones like buying a gondola for the Gowanus Canal or winterizing a playground by putting it under a science fiction style retractable, transparent dome. Around 100 community members then volunteer to be delegates and do the research needed to assemble these suggestions into feasible proposals. These delegates work together to weed out the totally unworkable plans, while grouping the workable ideas into categories, with the help of the council member's staff. The delegates then split into groups based on their area of interest, such as public health, safety and sanitation. The delegates in each subgroup will then meet between five and ten times before March 2012. They also will need to spend some of their free time researching the city's many rules and regulations to understand what each project requires. Because they have a finite budget, delegates are encouraged to look for ways to get the most out for the least amount of money. By spring, the committees will have selected their favorite ideas and, together with the council member, fleshed them out enough to go on a ballot. The elected officials will then gather their constituents' ideas and hold a district-wide vote where the public chooses which projects will get priority. This will allow the discretionary budget to be spent according to the will of the residents. "I had no knowledge [of the process] before, this is why I got involved, I see flaws and they don’t get fixed," said Rahman. "But I started to understand bureaucracy and why it takes so long." As they work through the process, residents come to appreciate just how difficult it is to make a working budget. At a 39th district environmental delegates' meeting, the group discussed ways to improve trash pickup and recycling, keeping in mind what the Department of Sanitation is and is not authorized to do, and adhere to the rules on what discretionary spending and capital money can and can't buy. This is hardly a trivial task for people with limited bureaucratic experience, many of whom have full-time jobs. Participatory budgeting also requires extra effort on the part of council staff as they supervise the delegates and try to make sure all members of the community have the opportunity to participate. In Chicago, Vandercook said that the first year saw a disproportionate number of college-educated and white participants. The alderman’s staff has since improved its outreach, using word of mouth, online social networking and other tactics, so that people from a wider range of economic and ethnic groups have gotten involved. In New York, the diversity of the participants may depend on the individual community. "The thing about our district is that it's extremely gerrymandered and diverse," said Trina Hickey from District 39. "So we get a good mix of people." "A big part is community development," added Lerner. “Groups which ordinarily never work together, now do." 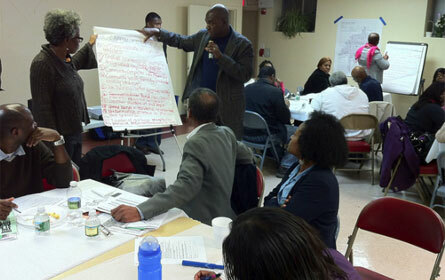 Proponents also say that participatory budgeting brings people closer to their elected officials. After three years of the program, Alderman Joe Moore has become "hugely" popular among participating residents, according to Vandercook, and his election victory margin rose significantly. Lerner said that in Brazil, mayors who instituted participatory budgeting were about 10 percent more likely to get re-elected than those who did not. Alex Moore said that because the program is brand new, the council members expect to make mistakes. Each district will make adjustments so that the process better fits its needs. But overall, many participating residents are excited about the project and the transparency it can bring. "We're not used to looking at other countries for ideas about democracy," said Lerner. "We think we know best, what can we possibly learn from Brazil? We should pay closer attention." The Retail, Wholesale and Department Store Union (RWDSU) has led the union lobbying efforts on behalf of the bill. Over the past year, the union has pushed the "argument that this is a pragmatic, common sense bill that will help working people, our local economy, and businesses in the city, Dan Morris, a spokesman for the union said. He said the union has arranged for civil rights leaders like Rev. Al Sharpton, other clergy, and constituents to lobby City Council leaders. A massive protest is planned for Monday, the day before the council hearing, at the Riverside Church. "If she supports it, it'll pass, and I believe it'll even override the mayor's veto," said Councilmember Oliver Koppell, who is the bill's lead sponsor. "If she doesn't, it won't." For Quinn, a likely mayoral candidate in 2012, the vote is a tricky one. To kill the bill by not calling it to a vote, as she did last year with a bill requiring that workers in the city get some paid sick days, would lose her supporters on the left; to support it would cost her votes from business owners. A former housing activist, Quinn has widely been seen as generally siding with Bloomberg in an effort to get his support and that of the business community. But she has occasionally strayed from that supporting measures to rein in city contracts, for example, or lashing out at the city's plan to tighten eligibility for homeless shelters. While supporters of the living wage say they have tried to address some of business' concerns and perhaps win Quinn's support -- business owners still vehemently oppose the bill. "It's as bad as bad can possibly be," said Robert Schwartz, 70, who owns three shoe stores in Manhattan and Queens with 49 employees overall and salaries that range from minimum wage to $100,000 a year. Only four or five people make less than the living wage in Schwartz's stores -- Eneslow, The Foot Comfort Center -- but he said that this bill will still hurt his bottom line and his ability to expand. "Nobody else has the level of taxes and cost of doing business we have here. There are fees to put signs up, you've got to pay to take care of the disabled," he said. "If there's going to be one more layer of costs we're going to have to add on, the chance that we're going to open up new stores is virtually non-existent." In some cities studied, like New Orleans and Los Angeles, the wage increases amounted to an average of less than 1 percent of each firm's overall operating costs. Santa Monica reported a 1.5 percent hike in operating expenses, which Luce said was one of the highest hikes in the cities she studied. "There's lot of examples of firms who say they can't make it, but once they're mandated to, they do it and they can survive, she said. Businesses, though, back his findings. Nancy Ploeger, the president of the Manhattan Chamber of Commerce, worries about the effects on blossoming entrepreneurs looking to start franchises. "No one is going to open a Subway if they have to pay $11.50 an hour, she said. Mike Veneziano, the vice president of finance for Doherty Enterprises, a company that owns 50 Panera and Applebee's restaurants in New York, agreed. Doherty has a dozen new restaurants in the works, but he is worried about the legislation's possible effect on where to put those restaurants and their viability. "We're really worried about it, and we're worried it's going to deter us from opening future locations and worried it will hurt existing businesses," said Cathy Coughlin, Doherty's vice president of human resources said. She said that most employees make more than minimum wage, but to start entry-level employees off at $10 or $11.50 an hour would mean the company would have to raise wages for long-term employees, too. "Restaurant operating profits are really minimal, so to shave away even more costs in this economy is a big concern to us," Veneziano said. Before she can do that, she wants to find her own place. I live at home with Mom, we all know how that is, she said. As for school, she said she'd like to do a law degree, but first she needs to complete a bachelor's degree: I want to start small, even if I just get the pre-law. Just to get back there it's a start." In the meantime, she hopes the speaker will vote for the bill: "We're looking to Christine Quinn to be that deciding vote. She can say, 'this is needed.'" Apple Eco-Friendly Cleaning co-owners regularly meet at member Luz Maria Arias' fourth floor walkup in Jackson Heights. 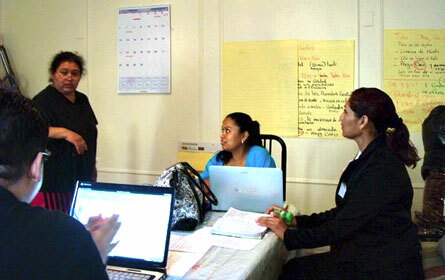 In 2006, Teresa Perez and 14 other immigrant women began meeting at the Center for Family Life in Sunset Park to launch an employee-owned housecleaning business. Together, they called it SĂ­ Se Puede. The name was a nod to immigration reform protests then popping up across the country but in Brooklyn, it doubled as a sales pitch to flush homeowners in neighboring Park Slope: We Can Do It! Within four years, SĂ­ Se Puede’s worker-owners, many of whom did not speak fluent English, tripled their wages to as much as $25-an-hour. Last year's open house to recruit new members drew over 90 applications for 13 spots. The company, now with 37 worker-owners, has grossed $1.6 million. So, can SĂ­ Se Puede's success be replicated? 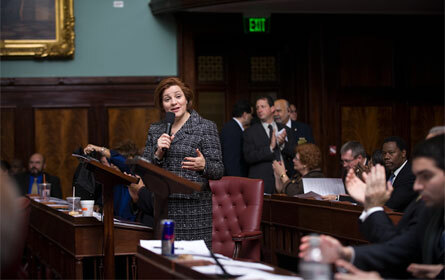 City Council Speaker Christine Quinn hopes so. In an October speech widely reported as a balancing act between business interests and the then-ascendant Occupy Wall Street movement, Quinn, a likely mayoral candidate in 2013, pledged funding to the Center for Family Life to incubate three new worker cooperatives per year in low-income neighborhoods. It is welcome support; there are fewer than 20 such co-ops in the city. Organizers say there should be more. Worker coops, they maintain, create living wage jobs and, in partnership with food, housing and credit union cooperatives, have the potential to transform high-poverty neighborhoods. For that to happen, though, significant barriers, not least, access to capital, must be overcome. Lack of information is another huge problem, says attorney Ted De Barbieri, who advocates for community development organizations through the Urban Justice Center. Supporters readily admit the average straphanger does not have a clue about what a worker cooperative is or how it functions, much less that employee-ownership can raise wages. What is certain at this nascent stage is that worker cooperatives transform owners' lives. "I was able to grow my ambition," Perez said through a translator. "Before, I'd say I can't study but now I say, 'I would like to go to school.' Now, I think of things like that." The most well-known cooperative in New York City is probably the Park Slope Food Coop. It is the largest of its kind in the nation, and by co-founder and general manager, Joe Holtz’s estimate, people join for a sense of community as much as for the cheapest organic tomatoes in the five boroughs. Worker coops, which started organizing through the NYC Network of Worker Cooperatives in 2009, are slightly different. Economic and social justice motivates many of their owners. In the south Bronx, Green Worker Cooperatives creates jobs, "as a response to high unemployment and decades of environmental racism." In Brooklyn and Queens, former day laborers formed Apple Eco-Friendly Cleaning to escape buyer whims at la parada, a decade-old, all-weather corner at the intersection of Marcy and Division where women line up for work every day. Take the Brooklyn-Queens Expressway farther south and factory workers fed up with standing eight-hours-a-day, are meeting weekly to create Golden Steps, which specializes in non-medical elder care. “These are the new generation of worker coops," said Vanessa Bransburg, coop coordinator at the Center for Family Life. "Even if you don’t know how to write you can join." From California to Maine, over the last 15 years low-wage workers have steadily organized employee-owned small businesses. The trend counters a common perception that coops are products of middle-class enclaves like Park Slope. At national coop conferences, Bransburg said, her Sunset Park contingent stands out among largely white, male crowds: "We typically require translation and childcare." If labor exploitation initially pushes workers into forming coops, those that stay do so because of an intense commitment to the welfare of the group. It is this orientation toward consensus, not profit that distinguishes the worker coop model from traditional businesses. Along the way, worker-owners discover and develop an enviable set of skills, not least, patience and conflict resolution. "It's very difficult to get along with 20 to 30 people, each one having different opinions," SĂ­ Se Puede vice president Catalina Rodriguez said through a translator. "You have to be very open." Listening and a willingness to compromise, as well as the courage to enforce established rules, benefit Rodriguez. Before forming SĂ­ Se Puede, Rodriguez earned $8 an hour to clean homes. Invariably however, homeowners also expected her to care for children and prepare meals, and Rodriguez was in no position to object. She received no pay for overtime. Now, she said, "I manage my own time and for four to five hours of cleaning, I earn up to $120." After a year in operation, the owners of Apple Eco-Friendly Cleaning earn more money than could be had for the few hours they would work after long waits at la parade. But getting there and the time demands -- six months of twice daily meetings for about five hours --whittled down interest from 20 women to the current five who often meet in the Jackson Heights living room-bedroom-office of member, Luz Maria Arias. It is a strong reminder: Worker coops are not easy. "Not everyone wants to become an entrepreneur or face the responsibility of being an owner," said day labor organizer Ligia Guallpa. She cautions against well-meaning nonprofits inserting bodies into pre-packaged companies and industries. Instead, the impetus should come from the workers. During Guallpa's weekly support meeting for women working at la parada, some of them asked for her help in forming the company. Excluding the salaries of Bransburg and Guallpa, neither SĂ­ Se Puede nor Apple Eco-Friendly Cleaning required much up-front funding. Members pooled their money to get the little that they did need. But for many if not most worker-coops, access to capital has been a persistent issue -- and one that limits coops to come-as-you-are sectors like cleaning or childcare. Most banks do not recognize the coop model. Even if they did, "service-industry workers typically don't have the wealth or assets that banks traditionally look to for collateral," said Carmen Huertas-Noble, an associate professor at CUNY School of Law and founding director of its community and economic development clinic. As a result, worker cooperatives typically attach to community-based nonprofits. Others also seek funding from local credit unions or the National Consumer Cooperative Bank based in Washington, D.C.
Other funding sources may be emerging, though. In addition to Quinn’s $150,000 pledge, the United Nations recently launched a global campaign declaring 2012 the year of the cooperative. And in December, U.S. Rep Chaka Fattah of Pennsylvania will introduce a bill to help grow coops nationwide. At the neighborhood level, SĂ­ Se Puede and Apple Eco-Friendly Cleaning are encountering a new challenge: competition. SĂ­ Se Puede has experience but Apple’s owners mix their own non-toxic cleaners, a competitive advantage that opens another exciting prospect for 50-year-old Arias. "Maybe we’ll become millionaires by making products and not cleaning!" she said in Spanish, to laughter from her four co-owners. They are huddled around their other office, a four-top in Starbucks. "Look, dreaming doesn’t cost anything," Arias says, with a deep shrug. "This is America." Carla Murphy is a freelance journalist and graduate of the CUNY journalism school. Mayor Michael Bloomberg celebrated the work of his Center for Economic Opportunity in 2007, but in the years since poverty in New York has increased. What is the city's response? Budget cuts. 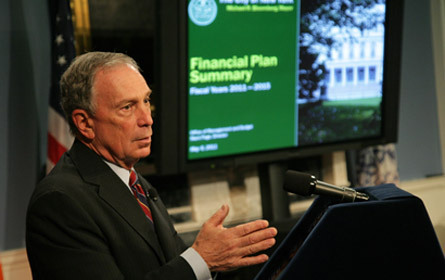 Less than two weeks after â€¨the U.S. Census Bureau reported that the city's poverty rate jumped to â€¨20.1 percent in calendar year 2010, Mayor Michael Bloomberg's budget â€¨director demanded that all city agencies, including education and uniformed â€¨services, immediately plan to cut 2 percent for the remaining eight months of this fiscal year and 6 percent next year. Yet a series of reports make it clear that even without the latest round of cuts, poverty agencies -- facing rising need and falling resources -- â€¨cannot maintain services.â€¨ In fact, the Mayor's Management Report for fiscal year 2011, released in mid-September and not generally known for highlighting â€¨bad news is â€¨full of bad news. A companion report from the mayor's Office of â€¨Contract Services and a new Independent Budget Office fiscal brief on children's servicesprovide further evidence that the agencies can't meet their stated goals. But the mayor in his own press release for the management report ignored all that saying simply: "The data show that city agencies continue to provide the high-quality services that New Yorkers have rightly come to expect." The U.S. Census report in September not only noted the overall poverty â€¨rate rising to 20.1 percent in 2010, up from 18.7 percent in 2009, but that the rate for families with children headed by single mothers â€¨in New York City reached 41.1 percent last year, up from 38.8 percent in 2009. The mayor responded: "When the economy slows down, there are fewer jobs. â€¦ People pay less, tip less, whatever. That certainly filters all the way down." But he added, "The city has one of the strongest safety nets in the country." The safety net in some agencies, though, looks torn. TheAdministration for Children's Services itself notes in the Mayor's Management Report that â€¨there was a 20.2 percent decline in children in at-risk families receiving contract â€¨preventive services in 2011, â€¨compared to 2010 (down from 29,945 children served to 23,881). The â€¨decline, Children's Services reports, was "due to continuing pressures on preventive services." The new fiscal brief from the Independent Budget Office paints a larger picture of what has happened at Children's Services. Between 2000 and 2011 the agency shifted its emphasis from placing children in foster care to providing preventive â€¨services and therefore minimizing foster care placements. The shift â€¨"contributed to a 54 percent reduction in the number of children in â€¨foster care and a 28 percent increase in the number of children receiving preventive services while remaining in their homes," the â€¨report says. Then came the recent budget cuts. "Because spending on â€¨preventive programs is discretionary, these services compete with other programs for scarce city dollars," the budget office explained. â€¨This has led to a 25 percent reduction in the number of children receiving services over the last two years. The cuts are counter-productive in fiscal terms. A family preventive â€¨services slot, according to Children's Services, costs an average of $10,000. On the â€¨other hand, "the average cost of keeping a child in foster care â€¨averaged $49,000 in 2010," the budget office notes. The report goes on to explain the problems that providers face -- and will face in the future -- as budget pressures make funding uncertain. For instance, in early 2010, the mayor wanted to eliminate 3,000 preventive care slots. The City Council â€¨restored funding for 2,900 slots, but for only one year, fiscal 2011. Then in May 2011, the mayor continued funding for those 2,900 slots for the current 2012 fiscal year "and provided enhanced funding for â€¨2012 and later years." Yet, the brief continues, "significant risks" remain "as long as the â€¨majority of preventive services are considered discretionary by the â€¨state." "Budget constraints” have also caused cutbacks in another crucial part of the city's safety net for children: daycare. According to the â€¨Mayor's Management Report, total enrollment in subsidized childcare has dropped from 106,761 in 2007 to 98,643 in 2011, a 7.6 percent cut. In the most recent year, 2010 to 2011, 3,603 slots were â€¨lost. The elimination of childcare vouchers for 3,716 children between 2010 and â€¨2011 was, according to Children's Services, "driven primarily by a reduction in â€¨voucher resources." In addition, staffing at the agency has dropped by 1,712 in the past three years to 6,213, a 21.6 percent reduction. The strain appears within the offices of agencies dealing with low-income New Yorkers. Ten years into the Bloomberg administration, the Human Resources Administration blames delays in registering its $606 million human-services contract -- only 62 percent were sent to the city comptroller on time, vs. 97 percent on time in 2008 -- on the "implementation of multiple new automated tracking â€¨and management systems," a lot of contracts with similar start datesâ€¨and the "implementation of new business procedures." The Mayor's Office of Contract Services' annual Agency Procurement â€¨Indicators report for fiscal 2011, also released in September, shows human services contract delays extend to several other human services agencies. The Administration â€¨for Children’s Services, Office for the Aging, youth, homeless services, and various health agencies "continue to face significant â€¨challenges in their efforts to register contracts in a timely manner, â€¨as they simultaneously confront major budgetary constraints in the â€¨human services sector." Average lateness in registering contracts in these agencies "increased â€¨to 41 days in fiscal 2011 compared to 27 days in fiscal 2010." One result: Cash-flow loans from a city fund for human-service contractors who start or continue services in spite of not having a registered contract jumped from $29 million to $43 million in the past year. The Mayor's Management Report also shows that whatever strength the city's safety net retains stems primarily not from the city, but â€¨from federal and state funding and mandates. For instance, the number â€¨of New Yorkers receiving city-administered cash assistance from the Human Resource Administration's basic assistance program has actually fallen by 1.4 percent since 2007, from 360,700 to 355,600 in â€¨2011. At the same time, the enrollment numbers in the federal food stamp and â€¨Medicaid programs have grown dramatically. From 2007 to 2011 the â€¨number of New Yorkers receiving food stamps (funded by the federal â€¨government) has grown by 67 percent, from 1.1 million to 1.8 â€¨million. The city administers the program and has received an award for â€¨its role in expanding food stamp enrollments. The number of New Yorkers enrolled in public â€¨health insurance programs, including Medicaid, (funded by city, state, and federal â€¨governments) has grown by 14 percent, from 2.56 â€¨million to 2.91 million. The Department of Education differs from several of the human service agencies because of its nearly $2 billion increase in spending over â€¨the past three years. Its budget now totals over $19 billion in a $66 billion city budget. Despite that, â€¨problems are obvious even in the good-news Mayors Management Report. School class size increased in grades kindergarten through eight by an average of 1.6 â€¨students per class. In the crucial early elementary grades, average â€¨class size rose by 2.2 students. As scaling back in the city's capital budget has slowed school construction, the number of new class seats has dropped in just one year, from 18,525 in â€¨2010 to 3,684 in 2011. The percentage of elementary and middle school students in schools that exceed capacity increased to 24 â€¨percent in fiscal 2010, up from 20 percent in 2008. (Many 2011 results are not yet available.) Thirty one percent of elementary schools â€¨exceeded capacity in 2010, up from 26 percent in 2008. The department's convoluted management of student â€¨achievement data in the Mayors Management Report makes it difficult if not impossible to â€¨judge the educational impacts of the past three years of cuts. From 2008 to â€¨2010 the four-year high school graduation rate improved from 56.4 percent to 61.0 percent, and the rate for students with disabilities â€¨improved from 22.5 percent to 27.9 percent.â€¨But from 2008 to 2011 the percent of students in grades three to eight â€¨meeting or exceeding standards in English language arts declined from â€¨57.6 percent to 43.9 percent. In math the percent declined from 74.3 â€¨percent to 57.3 percent. The department blames the achievement declines in grades three to eight on changes in state's method for scoring standardized tests, but achievement indicators crafted by the department itself also show â€¨declines. For instance, the percentage of schools receiving As or Bs â€¨on the department's own "School Progress Reports" dropped from 79.0 â€¨percent in 2008 to 62.3 percent in 2010. In another department-created indicator, the percent of schools with "Well Developed or Proficient on â€¨Quality Reviews" dropped from 94.7 percent to 84.1 percent between 2010 and 2011. The â€¨management report explains, "This change reflects a higher standard of â€¨school performance for schools to meet â€¦ to ensure all schools are â€¨ready for the increased challenge of the Common Core Learning â€¨Standards." The city recently laid off some 672 school aides, but mayoral threats to lay off teachers have been abandoned. It should be noted, however, that through resignations and attrition, school staffing from 2008 to 2011 fell by 6,059 or 4.3 â€¨percent. This decisions by the mayor and his school chancellors to not fill these vacant position is of course the main reason for increasing class size. The round of budget cuts now underway could prove to be much more challenging to agencies and service beneficiaries and could faceâ€¨more challenges from the City Council and New Yorkers. Put simply, the two city management reports and the Independent Budget Office's report on one human service agency together suggest that city agencies are stressed and that poor New Yorkers are not getting the level of services they did three or more years ago. The new tack in the budget-cutting directive -- demanding across the â€¨board cuts, with no exceptions -- is especially troubling. The evidence in these reports is that the cuts are already disproportionate. School kids, children at risk, working mothers, poor seniors -- they are the ones experiencing reduced services. Glenn Pasanen, who has taught political science at Lehman College, has been in charge of Gotham Gazette's finance topic page since 2001. "Thank you for calling Workforce1," begins the recorded greeting. "Your success begins here." If you called, you live in New York City and are one of an estimated 600,000 city residents who need a job. Many lack an advanced education, a professional network and financial resources. With these handicaps, they must find work in the most competitive job market in decades, in one of America’s most competitive cities. And so thousands of them -- 387,661 people in 2010 -- will try and find employment through work-related education, job training and employment services -- assistance known as workforce development. For them, the workforce development system is a lifeline to the job market and employment. For many workers, the lifeline falls short. It simply cannot overcome the shortage of employment, or provide work paying a decent wage. Workforce development may offer a path to employment â€“ but not to the middle class. 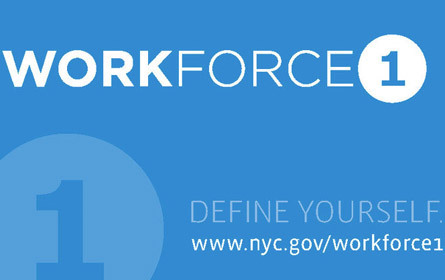 Workforce1, as well as any single organization can, represents workforce development in New York. But it is only a small part of the city's diverse workforce development system, which technically is not really a system. It's more a collection of independent programs that operate, in a thousand different ways, with the shared intention of helping businesses fill their labor needs and New Yorkers get jobs. It is a collection of nonprofits, public and private colleges, local businesses, unions, and a number of city, state, and federal organizations that provide, fund, and oversee work related programs. The Department of Small Business Services (which contracts Workforce1), the Human Resources Administration and the Department of Youth and Community Development contract out the majority of public services to providers. These providers -- and there are thousands of them -- operate in every borough as a bridge between workers without work and businesses with jobs. Workforce1 has offices in all five boroughs, each managed by a nonprofit, for-profit or educational institution that won a competitive contract. These centers prepare and connect New Yorkers with job opportunities, but the priority is jobs placement, the connect part. The first stop for job seekers is a two-hour introductory session delivered by a career advisor like Gwendolyn Gladden. It's like a class for the jobless. Standing in front of 30 jobseekers wearing a neatly ironed power suit, Gladden lectures with a mix of hope and realism. "Don’t come with that old tired energy," she said. "Come with that enthusiasm. Today is the day I find employment." She reminds the class it takes three months to find a job â€“- and only if they treat finding a job like a job. Yes, she said, $80,000 salaries exist, but not everyone can get one. And some of the students may have to change professions. After all, Gladden did. After 20 years in the health care industry she lost her job. So she came to Workforce1 four years ago. Now a career advisor, she helps those who sit where she once sat. A majority of the jobseekers receive general assistance on how to navigate the job market and ace an interview. They get help on resume building, interview prep, career assessment, counseling and access to job listings. Those who qualify may receive more substantial and specific training at one of Workforce1’s three sector-oriented centers. The city’s total workforce development expenditure is $1.36 billion, with $615 million coming from city revenues and the rest from a variety of sources including Congress under the Workforce Investment Act. Federal funding for Workorce1 has decreased from about $62 million in 2006 to just over $36 million this fiscal year. Because of budget cuts, the Individual Training Grant voucher program, which provided funding for some specific skills training, has been temporarily suspended. This has affected the Transportation and Industrial Center in Queens, which provided Computer Numerical Control machinist training. The Long Island City Health Center'sparamedic and emergency medical technician programs also have been suspended due to the funding problem. Workforce development began seriously with the 1960s War on Poverty. The system trained entry-level workers and "more or less threw them over the wall and hoped they landed in a job," said Paul Osterman of MIT's Sloan School of Management. Now the city, like Workforce1, follows a demand driven strategy: work with businesses, learn what jobs are or will be available, and train people for those jobs. The problem, though, is the available jobs. Some economists like to compare the American economy to the letter U -- some high-income jobs on the top, a lot of low-income jobs on the bottom, and a hole where middle-income jobs used to be. One System for One City, the city’s state of the workforce development system report, found, "As a tentative recovery began in 2010, employment growth occurred both in high paying sectors like finance and insurance and professional services, and typically low paying sectors like health care, retail, and accommodation and food services." The recession has obviously led to a jobs deficit. But even if thousands of new jobs are created, middle-paying manufacturing jobs are unlikely to return from the grave. The job market will likely continue to be “U” shaped, which means lots of low-wage jobs that help New Yorkers survive on the ragged edge of the economy with little chance of escape. There is a good jobs deficit. Of course, many decent middle-paying jobs exist. But less educated workers, typically those in the workforce development system, are unlikely to get them. Where are all the Good Jobs Going? a recent book on job quality in America, stated, "Good jobs are not disappearing for everyone, but they are largely disappearing for less-educated workers." Only 9 percent of the people who used the city's public workforce system in 2010 had a college degree. Businesses benefit from the workforce development system, says Matt White, assistant commissioner of policy and planning from Small Business Services, because it connects them to qualified job candidates in a quick and cost-effective way. Some job seekers benefit by finding work. But the quality of that work concerns some experts. The average job placement from the workforce development system pays $10 to $11 an hour, according to James Parrott, deputy director and chief economist of the Fiscal Policy Institute. That might be tolerable if placements led to promising careers. But Parrott says upward mobility is not likely. "My sense is that the majority of job placements don't have significant advancement opportunities," he said. With so many people needing jobs, the focus has to be on placement as opposed to getting people on a career ladder, Ester Fuchs, a professor at Columbia University who helped create the city's workforce development strategy, said. The program, she added, had to concentrate on "short term training as opposed to the long-term career training." "Demand is so high now," Fuchs said. "The general view is that we have to serve the large numbers of people who are looking for employment. And we have to work with the business who are offering jobs." The situation, by some measures, has improved. Workforce1’s median wage of job placements increased from $9 an hour in 2009 to $10 in 2010, and 75 percent of those jobs were full-time. "We developed an expertise there," said Andrew Campbell, Brooklyn’s Workforce1 Deputy Director. Now there is a mission to place workers in jobs that pay an hourly wage of $15 or more. Any gains, though, could be threatened by budget cuts. Parrott, White and Osterman agree that without more funding the workforce system is unlikely to help workers advance into middle paying jobs. Lack of money "hurts advancement opportunities for customers," said White. Osterman put the need for funding bluntly: "Peoples' lives and careers are at stake, and these programs are important." Bloomberg wants to expand Workforce1, despite funding cuts, and hopes to achieve 40,000 new job placements in 2012. The city reported 24,701 Workforce1 job placements last fiscal year, up from 17,218 in 2007. Recently, however, those numbers were called into question. Seedco, a nonprofit, runs both the Upper Manhattan and Bronx Workforce1 centers. "In at least 400 cases in three months, [staff members at a job center] had taken the history of jobless clients, changed dates and salaries, and claimed past employment as a job found, " Michael Powell of the Times wrote. In response, the city invalidated 44 percent of this year's Seedco job placements. The investigation is ongoing. Fake jobs aside the question remains whether the proposed 30,000 or 40,000 jobs will be good jobs? Or will they be for part-time cashiers making little more than minimum wage at a new tourism center that thrives because the dollar is weak? The lack of skills among many job seekers and the shortage of good jobs create a grim picture. But as Sydney Fuller-Jones of Boston, who has a job and still qualified for welfare services once said, "Any is plenty in the land of none." 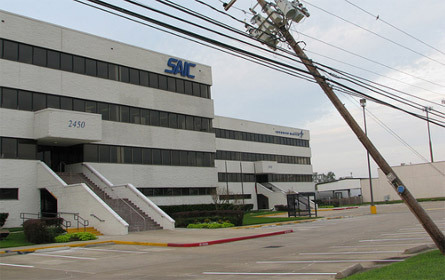 Science Applications International Corp., or SAIC, the main contractor on the CityTime project, has some 41,000 employees at locations around the world, including this one in Texas. An executive with the company has been charged with taking more than $5 million in kickbacks on the project. The idea that private companies can do much of what government does and do it better and cheaper has taken a battering in New York City over the past few years. News accounts and prosecutors have detailed mind-boggling cost overruns on the CityTime project. A shadowy company whose owner was having an affair with a top Department of Education official allegedly bilked the department out of millions of dollars. And so on. Yesterday the City Council stepped into the fray. By a unanimous vote the it passed a bill sponsored by Councilmember Darlene Mealy that would subject city contracts to a kind of cost benefit analysis and require agencies to publicly disclose what services they plan to contract out in the coming year. Last year, according to the council, the city spent more than $10 billion on private contractors. This amount will go up by about 6 percent this year â€“- far more than the city budget overall. 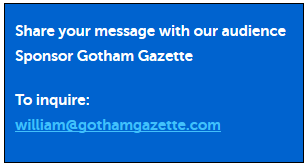 As Gotham Gazette reported this spring, the contract budget has grown by more than 70 percent during the Bloomberg administration. While social service contracts â€“ many with nonprofits â€“ account for the largest chunk of city contracts, the biggest increase has come in professional service contracts, which mushroomed from $357 million in fiscal year 2003 to nearly $1.5 billion projected for this year. Against this backdrop -- to say nothing of cost overruns and corruption -- that contract budget became a point of contention during last spring's contract talks. City Councilmember Robert Jackson for one repeatedly questioned why the administration was increasing contracts at the same time it was threatening to lay off teachers. Municipal employee unions, notably DC 37, the city's largest municipal employee union, have balked at taking tasks away from their members and giving them to private often non-union companies. The administration has said it needs specialized outside expertise, and some officials â€“ notably former Deputy Mayor Stephen Goldsmith -â€“ have argued that private contractors can deliver service more cheaply than city workers. The council bill -- Intro 624 -- takes direct aim at that contention. Before a city agency could extend, renew or enter into a contract worth more than $200,000 it would have to analyze whether the contract results from displacement of city workers or would displace city workers. If the study determines some city workers would lose their jobs, the agency must then look at the benefits and costs of contracting out the work and submit that analysis to the city comptroller, who reviews city contracts. In addition, after receiving bids, the agency would have to analyze the costs and benefits of the contract and tell the council, the comptroller and union officials why the contract makes sense for the city. The council can hold a hearing on the contract in question. More generally, every year the administration must submit a contracting plan for every city agency. Along with boosting transparency, this provision is seen a possible aid to small and minority contractors who would have more advance warning of upcoming city contracts, giving them time to prepare possible bids. Announcing the measure, Quinn portrayed it as a money-saving move. While privatizing government work has been seen as a cost-cutting measure, Quinn said in many cases, sending public work to private companies actually increases costs. The bill, he said, "will make sure that we are checking on whether we are saving New Yorkers money every time we consider contracting out." Council, though, has gone down this path before. In 1990, it passed Local Law 35 requiring similar analyses of contacts. But, as Quinn put it, "the implementation of that law has not lived up to its promise." She noted that in the more than 20 years since, only two costs analyses have been conducted -- two during the Giuliani administration and zero under Bloomberg. The new version -- 624 -- hopes to close loopholes that enabled the last two mayors to dodge the requirement. To many New Yorkers the biggest concern about city contracts has been high costs and low performance. Only last week, the city's special commissioner of investigation for the Department of Education found that Future Technology Associates, a firm the city hired to do computer work on school purchasing, payroll and finance systems, had overcharged the city by at least $6.5 million. Earlier in September, the New York Times reported that the cost of a contract for a computerized personnel system for the city had increased by more than five fold with the work far from complete. And then, of course, there is CityTime, the $63 million project whose costs rose to more than $720 million, amid what prosecutors charged was corruption and fraud. Already five people have been indicted in connection with that one. Asked whether the council bill would help avoid such abuses, Quinn expressed some doubt. "I hardly imagine that in an analysis you would have a column of estimated criminality involved," she said. But, she added, the increased disclosure and transparency could help warn city officials of cost overruns and other contract problems. "This piece of legislation is only the beginning," she said. "Oversight is a very important piece, one that is for a different piece of legislation." 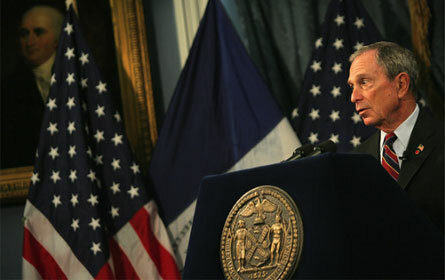 During the disputes over contracts, Mayor Michael Bloomberg has shown no sign of retreating from his reliance on them. And over the past months he has defended some of the most problematic ones. At one point he said the city did a pretty good job" on CityTime. And in response to questions from the Times about the problems with the personnel system known as Nycaps, a mayoral spokesperson said both it and CityTime are now "fully functioning systems used daily by thousands of city employees." 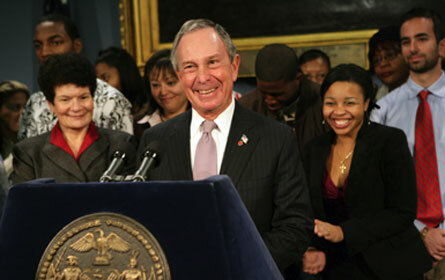 Bloomberg says Wednesday that he opposes the a law passed by the City Council . WNYC's Bob Hennelly reports the mayor says the bill will cripple the city's ability to be more efficient. "To put impediments to us getting the best deal for the taxpayers particularly during this economy is something we can not tolerate. We are just not going to have this bill," Bloomberg said. "This also is probably unconstitutional." With the council voting unanimously for the bill, it seems it could easily override any mayoral veto -- the kind of showdown that Quinn has rarely allowed to happen during her tenure. If -- as he implies -- Bloomberg takes the issue to court, it could set the stage for the dispute between the mayor and the council over contracts to drag on for years. In May, Mayor Michael Bloomberg announced a budget that relied almost exclusively on cuts to erase a budget gap. With more red ink on the horizon, will he do the same this year? If it's September, it must be time for Mayor Michael Bloomberg and his budget office to start cutting spending by city agencies. The current, fiscal 2012 budget that was adopted less than three months ago projects a $4.6 billion deficit for the next fiscal year. A year ago, facing a much smaller projected deficit for the next year -- $3.7 billion -- the mayor began a series of cutbacks that eventually reduced spending by $1.1 billion. If there was any doubt about fiscal prospects, recent reports from the state Financial Control Board, the state comptroller and the city comptroller dispel them. These grim reports from fiscal monitors and recent studies from the Independent Budget Office, however, also suggest some new ways the mayor could fill budget gaps. The key reality facing the mayor is that, unlike in recent years, there is no sign that the city will have a substantial budget surplus at the end of this year. Without something like last year’s $3.7 billion surplus, and with deficits averaging $4.8 billion over the next three years, the city's fiscal future looks "problematic" to the Financial Control Board and "challenging" to the state comptroller. Put a bit more dramatically, the board says, "The city's ability to avoid contentious expenditure reductions will be tested." Over the last three years, the mayor has shown a certain political genius in avoiding "contentious" responses to his 10 packages of budget reductions. To accomplish this, he has very effectively used his extraordinary discretionary powers to make modifying the city budget a year-round -- rather than once-a-year -- process, with little opposition from the City Council. The impact of 10 consecutive reductions is equally extraordinary. The State Financial Control Board totaled the effects: The $1.1 billion cut in 2011 was preceded by cuts of $1 billion introduced in fiscal year 2008, $2.1 billion in 2009, and $1.1 billion in 2010. Add them together and that means that the current $66 billion city budget is $5.3 billion smaller than it would otherwise be. The fiscal monitors are not in the business of telling the city how to balance its budget, but they do a good job of explaining how the mayor balances the budget and at noting the fiscal uncertainties the city faces. The uncertainties include questions about projected out-year budget deficits, collective bargaining, pension costs, workforce cuts and the use of reserve funds. In explaining why the city faces an ominous budget outlook, the state comptroller analyzes what actual revenues come in during a fiscal year and what actual spending occurs during that year. For instance, in spite of the cuts of more than $3 billion introduced in 2008 and 2009, "spending exceeded current-year resources by about $2.4 billion in FY 2009 and $2.1 billion in FY 2010." Those budgets were balanced only by using surpluses accumulated from previous years. In FY 2011 the report estimates that, because of unanticipated revenues from an improving economy, current-year spending exceeded current-year revenues by only $303 million. The report goes on to say, "For FY 2012, however, we project a current-year deficit of $4.4 billion, reflecting the city's heavy reliance on nonrecurring resources accumulated in prior years to balance the budget." The Financial Control Board suggests what the mayor should do next: "The task for the city will be to manage the FY 2012 budget in a way to start to build a surplus to the level achieved in FY 2011." In other words, the mayor should continue the same early-year and mid-year budget cutting he has made into a near science. But there are many other uncertainties this year, including contract negotiations with city workers. The mayor's current three-year wage freeze, for instance, has freed up labor reserve funds for balancing the current budget. The question is how long the mayor can keep the freeze on. According to the state comptroller's report, more than 90 percent of the city workforce is working without a collective bargaining contract. And the adopted budget includes funding for only a 1.25 percent annual wage increase for three years following the expiration of the three-year wage freeze. Since the three-year freeze and proposed minimal raises for the following three years are still being negotiated, the state comptroller points out, "If instead wages were to rise at the projected inflation rate during the six-year period without any offsetting savings, costs would increase by $1.5 billion in FY 2012, $1.6 billion in FY 2013 and reach $2.7 billion in FY 2015." The teacher's negotiations present more uncertainty. The state comptroller notes that the city "has yet to conclude an agreement with the United Federation of Teachers for the previous round of bargaining." That means that in FY 2009 and 2010, while other civilian employees received 4 percent annual increases, the teachers had no increase. Instead, the labor reserve funds for teachers again went to budget balancing. Negotiations between the teachers union and the city, with the help of a mediator, continue, but a settlement apparently is not imminent. The state comptroller concludes, "A retroactive agreement similar to those negotiated by the city's other unions for those years would increase costs by $1.7 billion in FY 2012 and by $900 million annually thereafter." Another uncertainty is the projected cost of city pensions. Costs have increased dramatically beginning in fiscal 2003 after the "state enhanced benefits, and pension fund investments fell short of expectations," according to the state comptroller. The city currently estimates pension costs, which averaged about $1.4 billion a year in the 1990s, will be $8.4 billion in fiscal 2012, increasing to $8.7 billion in 2015. In anticipation, the city in its four-year financial plan set aside $1 billion a year in a reserve fund. But it's not clear it will need that fund this year.. Nor, on the other hand, is it clear $1 billion will be enough. The state comptroller and Financial Control Board, object to what the mayor is doing. "The city, to its credit, deposited $2.5 billion in the Retiree Health Benefits Trust during the last economic expansion to fund these costs," the state comptroller says, "but it has begun to draw down these resources to help pay current operating expenses. â€¦ The state comptroller believes the city should avoid using these resources to help balance the budget." The Financial Control Board agrees: "It is unfortunate that the city has continued to reduce the trust over the last two fiscal years to cover investment losses incurred in prior years while [post-employment benefit] liability continues to grow at a constant high rate." Yet this fund, which now holds about $2 billion, remains a tempting resource for an administration reluctant to find new and recurring tax revenues and that regularly uses ad hoc, non-recurring revenues for budget balancing. Cutting the size of the city workforce has also helped balance the budget. The fiscal 2012 executive budget in May reduced staffing by more than 9,000 positions. However, the City Council reversed some of those cuts. The state comptroller estimates that the final budget eliminates 5,475 slots in fiscal 2012, including 2,655 positions in the Department of Education. Originally, the mayor wanted to eliminate 6,166 schools jobs, including 4,166 teachers. But the negotiated restoration of 4,666 education jobs should not mask the loss for the school system. Many of the restored positions, for instance, are funded for only one year. The state comptroller notes that in fiscal 2012 the schools will have 7,000 fewer teachers than in fiscal 2009, and another 1,200 fewer in fiscal 2013. The effect? "Class sizes are expected to continue to rise, and other services, such as after-school programs, may be reduced," his report says. The fiscal monitors also touch on some management areas where potential savings could help budget balancing. One is the rapidly growing contracting budget, which emerged as a point of contention during last spring's budget talks. The state comptroller notes the "heightened scrutiny because of the increasing amounts spent on [contracted] services, and instances of waste and fraud." This, of course, is undoubtedly a reference to the scandal surrounding the City Time contract, which continues to unfold. Spending on contractual services rose by nearly 75 percent between fiscal 2001 and fiscal 2010. It then totaled $10.6 billion, or 16.3 percent of the 2010 budget. According to the state comptroller, the 2012 budget is slightly less -- $10.5 billion for contractual services -- although that could grow as the city receives federal and state grants later in the year. The three largest areas are education-related: payments to private special education and charter schools ($2.2 billion), student transportation ($1.1 billion), and direct professional education services ($845 million). The Independent Budget Office has noted that, as school budgets have been cut, school contracting has increased. The city could also save some money by reducing overtime costs, now over $1 billion a year. Uniformed agency overtime alone, including civilian personnel, reached $963 million in fiscal 2011, according to the Financial Control Board. That's $240 million more than the city projected at the beginning of the fiscal year. The board says the current four-year financial plan "grossly underestimated" future overtime costs. The city comptroller estimates the city's overtime projection for fiscal 2012 is $210 million less than it will ultimately be. If he is correct, the city would have to fund the extra costs during the fiscal year, adding yet another uncertainty to mid-year budget balancing. As the mayor begins his mid-year -- or earlier -- modifications in the current budget to meet next year’s $4.6 billion deficit, there is no indication he is willing to address tax revenues. But as the reality of yet another $1 billion to $2 billion mid-year cut in agency services unfolds, it might be time to do just that. The Independent Budget Office's Budget Options is an excellent source of practical expenditure-saving and tax-revenue programs. One of the more familiar ones is a restoration of higher personal income rates for joint tax filers with incomes above $200,000. New top rates of 4.013 percent and 4.264 percent (affecting only 7.8 percent of city resident tax filers) would still be much lower than the top rates in effect from calendar 2003 through 2005 and most of the 1990s, yet produce an additional $450 million in fiscal 2012. In a recent web blog the budget office noted that the city's biggest tax, the property tax, will bring in $17.6 billion in fiscal 2012, about 42 percent of city tax revenue. But it would generate $13.5 billion more were it not for "the slew of [property] tax exemptions." Most of these exemptions, of course, go to government property and religious property, and so are untouchable. Some exemptions, however, could be challenged. Perhaps the most outrageous case is Madison Square Garden, which has not paid any property tax for decades, costing the city $15.1 million in lost revenue in this year alone. The Independent Budget Office points out that a case can also be made that some private institutions -- health facilities, foundations, charitable organizations, and private schools, colleges and universities -- could negotiate voluntary payments (called payments in lieu of property taxes, or PILOTs). Many do that in other cities. â€¨ Glenn Pasanen, who has taught political science at Lehman College, has been in charge of Gotham Gazette's finance topic page since 2001. 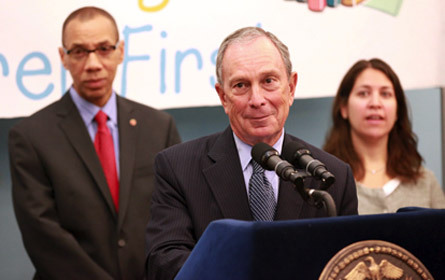 In August, Mayor Michael Bloomberg, shown here with Schools Chancellor Dennis Walcott, announced private philanthropists -- including himself -- would pick up the tab for the January 2012 Regents tests. In the face of extreme budget cuts and tough times, Mayor Michael Bloomberg recently has turned to private donations to fill some high-profile budget holes. Last month, Bloomberg announced that six private donors -- himself included-- would each donate $250,000 to reinstate a round of state standardized testing that had been eliminated because of budget cuts. "For thousands of our students, taking the Regents exams in January will mean the difference between graduating and not graduating," Bloomberg said at the time. "I've always believed that you can either complain about your problems or do something to fix them -- in New York City, we choose the latter." In this high-profile use of outside funding to provide a core service in the public schools, many education experts see more than just a last-minute save. "From a systemic point of view, this is a very worrisome pattern in New York and around the country,” said Michael Rebell the executive director of the Campaign for Educational Equity at Teachers College, Columbia University. Rebell, who critiqued the decision in a New York Times op-ed last month that lambasted states for leaving public schools in New York and around the country without adequate funding. Private money in the public service doesn't stop at education. Increasingly, donations fund all sorts of programs -- parks, social welfare initiatives and museums, to name a few. While some praise the philanthropy, others question the lack of funding by government and the increased influence these often-unnamed donors may have on policy and decision-making. In his announcement, Mayor Bloomberg emphasized the importance of a long-term solution for funding the January Regents, as the donations will only cover the 2012 tests. Rebell says the one year reprieve from budget cuts could hurt prospect for solving the schools’ funding issues in the long-term. Private donations like this alleviate pressure points, but they don’t fix the problem, Rebell said. "It takes the attention and the pressure off the need for adequate public funding of public education," he said. If the donors had not stepped in, he added, "People might have been up in arms when they saw graduation rates go down." From a government standpoint, the funding also poses a risk, said Charles Brecher, the executive vice president and director of research for the Citizens Budget Commission, a government watchdog group. "What do you do if it disappears? What if that money goes away?" he asked. Brecher, who is also a professor at New York University's Wagner School of Public Service, published a study in 2007 that tracked how private donations leverage public funding to the parks. Many parks have non-profits, such as the Prospect Park Alliance, that augment their park's public funds. Donations to the nonprofits are usually given with a stipulation that public funding will be maintained to certain levels, allowing donors to use their philanthropic muscle to preserve public funding -- even in times of budgetary crisis. Brecher said this often leaves "parks without Fifth Avenue and Central Park West as neighbors" with less public funding and comparatively limited funds. "It's always good to have extra resources," Brecher said, but "it's best done when it doesn't distort what otherwise would have been done with the public money." "They say 'don’t look a gift horse in the mouth' â€“ don't ask questions to someone who is giving money -- but in some instances you want to look the gift horse in the mouth," Brecher said. Last month, Bloomberg announced a $30 million donation from his own foundation -- and a matching one from hedge fund manager George Soros -- to fund a new initiative aimed at young black and Latino men. The city added $22.5 million dollars in public funding for the program to the City Council budget at the last minute, as well, alarming many City Council members who complained that they hadn’t been alerted to the change in the budget or included in the discussion. Queens Councilmember Peter Vallone Jr. now is looking into possible legislation that would prevent such late in the game additions to the budget. "I have no problems with private money for public programs," Vallone said, "but I'd just voted on a budget without more police officers, and we were on the cusp of closing firehouses. Yet after the budget was passed, there was an announcement for a program that had millions of dollars and no public oversight at all," he said. Bloomberg's announcement came less than a week after the council approved its budget. "If Bloomberg was able to find that money, then we should have been able to direct it to more police officers if we saw fit," Vallone said. Brecher said the funding for the initiative exemplifies how private donations affect the city's allocation of public funds. "In this instance, it probably did affect the priority setting process," he said. The $22.5 million addition was included in the final, printed $66 billion budget that was given to City Council members, but Vallone said it is "impossible to be aware of last minute additions in a massive document like that." Marc LaVorgna, a spokesman for the mayor, said that while the initiative's public funding was added at the end of the budget process, "the council was notified that we were seeking to add dollars for this program into the budget and the program was printed in the budget." He said that the presence of the private money in the deal had "zero to do with" the public funding of the program, adding that "the City Council changes literally hundreds of millions of dollars in the budget at the 11th hour every single year." Private donations often leave those in poorer areas with even fewer resources than they might have otherwise had. In public schools, parent teacher associations have long been sources of private funds. When services are cut, fundraisers and private donations fill out the budget. But in poorer areas, where donors are scarce, the services remain un-funded and can face cuts. The private funding also has an effect because upper or middle-class parents --the people at "the forefront of political advocacy" â€“ then are not affected by cuts and so are less likely to complain about them, Rebell said. The people who are hurt -- those in low-income communities -- are less able to make their concerns known. If more affluent parents have "found a way to satisfy their needs, it’s not going to come to the floor," Rebell said. "Its well-known that low-income people don't have the articulation or organization skills to protest it themselves." Vallone, however, would rather have the money donated than not. "We’re not living in John Lennon's imaginary world," he said. "We're living in a world where very few people would donate if their kids wouldn’t see the results."